Brands need to identify how to specifically target Millennial customers. Vietnam’s Millennials are changing the landscape of consumerism. These 18-35 year olds exhibit different purchasing behavior and require different marketing strategies to harness their interest in your products and services and above all their ever growing disposable incomes. 2018 witnessed the first year in over 25 years that volumes of fast-moving consumer goods (FMCG) experienced a decline in urban Vietnam, at 0.1 per cent, and recorded only a mild 2.4 per cent value growth, driven mostly by inflation. FMCG growth in rural Vietnam was more positive, with 5.5 per cent value growth and 3.2 per cent volume growth. FMCG marketers need not panic just yet, however, as there are several growing trends that shed a healthier light on the FMCG Millennial market. FMCG purchases are typically measured by what is purchased and consumed inside the home and does not include out-of-home consumption, where Millennials are flexing their economic muscle. Infocus Mekong Research’s 2019 Consumer Confidence Index is still very positive, at 91 points out of 120, only 1 point below 2018, meaning that consumers are still upbeat and willing to spend but are spending their hard-earned VND differently than their non-Millennial contemporaries. Millennial consumers shop very differently and look more for brand experience than other consumers and place a high value on the entire experience and convenience of spending money than non-Millennials, whose key focus has been on best value for money and brands that are “good enough”. Millennials, also known as Generation Y, are the demographic cohort that directly follows Generation X, consisting of individuals born between 1982 and 2004. Millennials grew up in an electronics-filled and increasingly online and socially-networked world. They are the generation that has received the most marketing attention. Having been raised under the mantra “follow your dreams” and being told they were special, they tend to be confident. In Vietnam, though similar to global Millennials, they are typically younger and defined by Vietnam’s turbulent history and the arrival of the internet and mass media. Thus, a typical Millennial in Vietnam was born ten years or more after the country’s reunification in 1975 and are defined by the arrival of the internet in December of 1997, making them aged from 18 to 35 but with very similar traits to their global brethren. The major difference between Millennials and older consumers can be best summed up as them caring more about the personalization of goods and services, with a keen eye on brand experience and enhancement, convenience and health, and being digital natives and much more brand astute and savvy than older consumers. Millennials almost always research their purchases online before any purchase. They compare and research online, visit stores to try, and then ultimately buy online to save money and gain convenience. These consumers enjoy and want their freedom and independence, and hence tend to go out much more in terms of dining and eating out, stepping out of the yoke of parental control. This is partially what is driving the reduction of FMCG in-home volume consumption, as they buy less to consume at home and more when they are on the go. Just visit any of Vietnam’s coffee shops, fast food outlets, and convenience stores and see the high-volume traffic. Circle K, by way of example, experienced double-digit growth in 2018, and outlets such as Jollibee are also seeing phenomenal growth due to this trend towards out-of-home consumption. Millennials are the drivers of everything digital. Ninety per cent own a smartphone and over 60 per cent own laptops, desktops, tablets, and even smart watches. Seventy-eight per cent made at least one purchase online in the last 30 days, highlighting a mega Millennial trend: online shopping. Most online platforms are thriving in terms of growth but are still hindered by supply chain issues and the limited use of electronic payments, but growth for some is in the triple digits. This further adds to the reduction of growth in the traditional FMCG market as digital purchases are impacting both modern trade and traditional trade growth. Ironically, of the $3 billion plus e-commerce market, some categories are already outselling modern and traditional trade. Banks and insurance companies in Vietnam have realized this digital trend explosion and are all offering omni-channel payment and purchase options, further catering to these tech-savvy consumers. In terms of product and service brand selection, Millennials choose brands and services that offer personalization, such as being able to design your own running shoes, and apps, which you can program with your preferred content, and all must offer convenience, such as free delivery, have a health platform, and be eco-friendly. These are the new parameters of brand selection and should evolve even further over the next few years. Another key trend is switching from local Vietnamese brands to international brands. This especially holds true for food and beverages, due to recent food safety and hygiene issues among some local brands. This is further exacerbated by the perception that Vietnamese brands should be cheaper to produce, creating the perception that local brands should cost less than international brands and hence consumers select international brands, as they are perceived to have better quality and assurances, even at a slightly higher price. Many FMCG companies have been quick to realize these changes. Nowhere can this been seen more prominently than the growth in digital advertising spend, which in a short five years has grown from about $30 million to an estimated $300 million in 2018. Though only accounting for some 17 per cent of total advertising spend, it does bare witness that FMCGs are fishing where the fish are: online. Almost all major FMCG’s advertise on Facebook and Google and even have their own fan pages and blogs for consumers to add and share experiences. This is one area where proper targeting and knowing exactly who your Millennial digital native is becomes crucial, to ensure you are measuring the impact of your digital campaigns to better understand your RoI, which Infocus can help with via our partner Miaozhen systems. Many FMCGs have embraced gaming to bring their messages to these young consumers. As all are digital and grew up with gaming, many companies are attracting consumers by gamifying their messages to generate brand awareness and consideration. 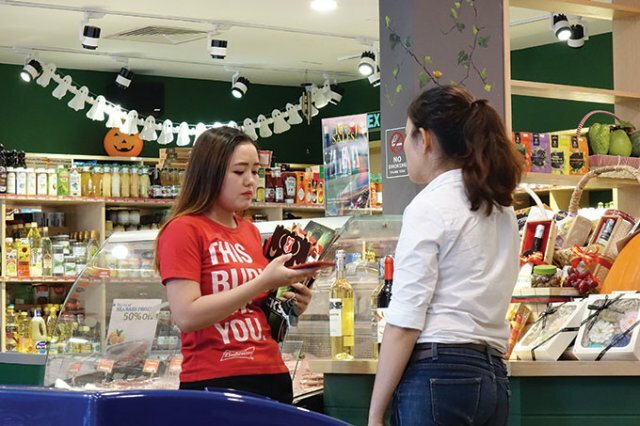 As Vietnam’s tech boom continues, many companies are reaching consumers with digital promotions, using QR codes to deliver discounts and vouchers to drive business. This again allows for immediate access and reduces cost, as paper and procedures are minimalized. Vietnam has become the land of apps. There are over 4,000 available daily to download. They allow FMCGs the power to gain invaluable information about their consumers, while driving their communications and allowing them to better target their consumers with algorithm preferences, making consumer choice so much easier. FMCGs are also embracing market place platforms, such as Shopee, Sendo and Lazada. These market places offer free delivery and ultimately convenience, further driving sales and reducing reliance on store presence, which is becoming more and more cost prohibitive. The use of social media has skyrocketed, from the obvious (Facebook, Google, Zalo, etc.) to the new - Instagram, Viber, and Facetime. FMCGs are placing themselves at the forefront of where Millennials spend most of their time; online and via their smartphones. This allows for continuous brand building in an ever more fragmented media market. Finally, many FMCGs have brought technology to the retail environment, where smartphone-targeted ad campaigns tell a consumer where the best deals are and what discounts can be had. Considering that smart technology has only been in Vietnam for seven years or so, it is amazing how fast the digital advertising age has transformed the FMCG landscape and will continue to do so. So, to ensure the continued growth in FMCG from Millennials, it is critical to offer a strong online presence, apps, gamification, smart tech retail messaging, online promotions, and, most importantly, content and products or services that meet these consumers’ expectations, which are personalization, convenience, a health platform, eco-friendliness, and a sense of belonging and an ability to share. If these can be achieved, the last challenge for success is to ensure you know how to specifically target these Millennials, which is all about knowing your target audience and their preferred medial channels and which categories they prefer for which media channels and what time to engage them.